In a medium saucepan, mix together chicken broth and diced tomatoes and bring to a boil. Add dry pasta, mixed vegetables, and Italian seasoning. Stir to mix ingredients and bring to a simmer. Simmer uncovered for 5 minutes then cover the pan. Cook over medium heat approximately 15 minutes until vegetables and pasta are tender. (May chill and reheat the soup the next morning, if desired.) Precook franks by cooking them for 10 minutes in boiling water. 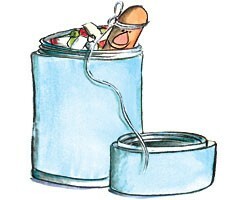 To pack for lunch, pour 1 cup hot soup into a thermos. With clean cooking string, tie a generous portion of string around the end of a cooked frank, creating a tight noose. Place the frank into the thermos, draping string over the lip of the thermos top. Screw the thermos lid on over the string, so that the string is easily retrieved when the thermos is opened. You can fish for the hot dog by pulling up on the string. Serving size: 1 cup soup and 1 frank. Exchanges per serving: 1 starch, 1 vegetable, 1 medium-fat meat. Carbohydrate choices: 1.